Also available at Aurea bookstore, in Madrid, the only bookstore specializing in classical Latin and Greek philology, archeology, ancient history,and Hispanic philology. A capitular letter is an uppercase letter that starts the text of a chapter of a book and is colored and adorned with plant or geometrical motifs. 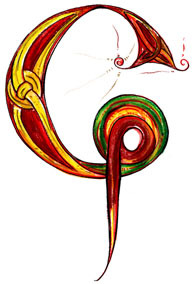 The capitular letters in the scriptorium of the Monastery of San Millán de Suso are characterized by their braids, their characteristic colors -reds and yellows- and by the animal motifs in their decoration. Codex 46 from San Millán, dated 13 June of the year 964, is one of the most interesting and extensive encyclopedic dictionaries in Europe, revealing the wealth of knowledge possessed by people in the Middle Ages. 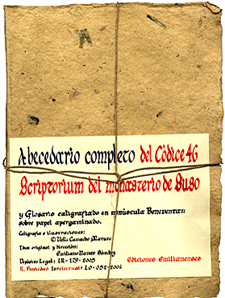 Moreover, the copyist of the scriptorium of the Monastery of San Millán de Suso introduced so many Romance words that the codex is truly a lexicographical treasure. Providing approximately 25,000 articles and 100,000 acceptations, the codex was studied by professors from La Rioja -Claudio and Javier García Turza- in 1997. Discovering the letters of the past. Drawing and using watercolors and India ink. Learning about the calligraphy of the past. Decorating your journal or your favorite books.